When it comes to location in Venice, the Hotel Ai Mori d'Oriente takes some beating. Located in the picturesque Cannaregio quarter, the canal side setting of this Byzantinestyle hotel lets you experience the real Venice. 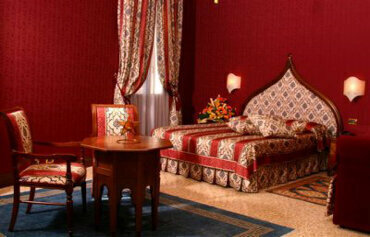 The public areas of the hotel are lavishly furnished with rich coloured tapestries and silks. 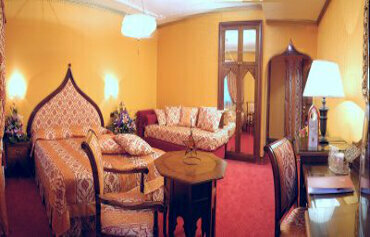 The Moorish style bedrooms are comfortable and equipped with all the modern touches you need for a relaxing stay. Start the day with a tasty buffet in the breakfast room, with the option of dining al fresco in the courtyard. Snacks and drinks are on the menu in the American snack bar and bar. Or why not watch the sun set over the city with a local Bellini cocktail on the terrace? And what is more, the Rialto Bridge, Grand Canal and St Marks Square are within easy reach too. Discover why the Hotel Ai Mori d?Oriente is a popular place to stay for a Venice city break. 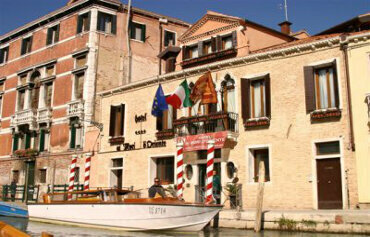 The Hotel Ai Mori d'Oriente has all the facilities you would expect from a 4 star hotel in Venice. Highlights include: a breakfast room, front terrace with canal views, bar, American snack bar, concierge, baggage porters, luggage storage, night porter, tourist information, safety deposit box, laundry and ironing service, WiFi internet access in public areas, lift and babysitting service. The hotel 55 comfortable guest rooms, including standard, superior and deluxe rooms and junior suites. All rooms have a mini bar, air conditioning, ADSL internet access, direct dial telephone, radio and bathrooms with courtesy kit. 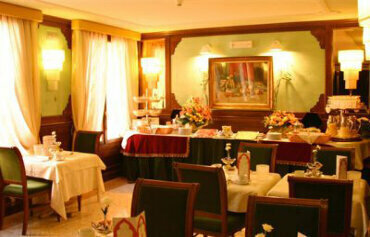 A breakfast buffet is served in the breakfast room each morning. Enjoy drinks and snacks from the American snack bar or a late night cocktail in the bar. The Hotel Ai Mori d'Oriente is located between the Grand Canal and the Madonna dell Orto Church ferry stop at the heart of the Cannaregio quarter of Venice.